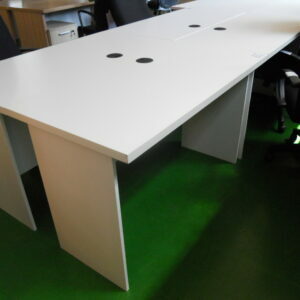 Has Been Office Furniture is the leading supplier of used office furniture in Johannesburg delivering throughout Gauteng. Our showroom and warehouses carry an extensive range of office desks including cluster desks, call centre desks, straight and l L-shaped desks, executive desks, reception desks, training desks, as well as desk divider screens. 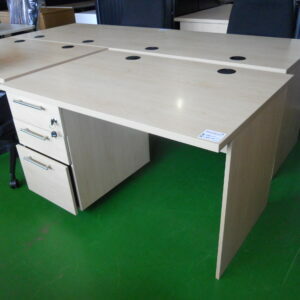 Our refurbished second hand desks are often believed to be part of our new range of office desks for sale. The only perceivable difference between our second hand desks and our new desk is the price. 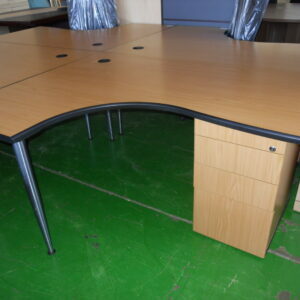 We offer quality used desks at a fraction of the standard retail price for new office desks. This is what drives our loyal client base to keep returning for any of their office furniture requirements. The crucial step in buying an office desk, or a number of desks, is the measuring up of the office space you have available. Even if one just paces out the area to get a general idea of the space, it will help in the selection of the ideal size of the office desk you wish to purchase. A visit to our Randburg showroom is highly recommended for the largest selection of second hand office desks on sale, or look out for special offers online, get a quote for new office desks, or contact us and our friendly sales staff will assist you with any office furniture requirements. Should you need us to match an office desk with any existing office furniture, send us a picture and we will respond with a quote via email with pictures of suggested items attached. Has Been Office Furniture also stocks a huge variety of other office furniture suitable for any corporate or home office needs, including filing cabinets, reception desks and furniture, boardroom tables, office chairs, and more. Contact us today for all your office furniture needs for great service, prices and delivery.